This is probably the hardest article I have ever had to write for reasons that will become obvious. I have thought long and hard about whether I should even write it, but I would not be honest to myself if I did not, as I believe that everyone should share knowledge about dive incidents so that we all may learn from things that happen to other divers, especially where something goes wrong or has an adverse outcome. Since about early 2000, the dive Club of which I am a life member, St George Scuba Club, based in Sydney, Australia, has run a regular night dive. These dives were originally organised by someone else and they were to be held every second Thursday night. They were so popular that within a few weeks we decided to have them every Thursday night. Within a few months, I took over the responsibility for organising them. Apart from periods when I have been overseas, I have organised all the night dives since then. We plan to dive every Thursday night of the year, Summer or Winter. On an average, we have had about 25 night dives a year, but in the past five years it has averaged about 35 dives a year. Each year about 4 nights are not dived due to closeness to holidays (eg Christmas or Easter) and another 13 are lost due to poor weather. At the dives we have had up to 17 members attending, although an average would be about 12 in Summer and 8 in Winter. On Thursday 3 February 2011 I organised the night dive for Bare Island. As I was taking a visiting American for a dive earlier in the afternoon, about six members joined us for the first dive. We entered the water at 5:04 pm and did a 51 minute dive to the Bare Island Deep Wall and then back via the first part of Bare Island Isolated Reef 1. The conditions at the start of this dive were not that of the weather forecast, with a very strong south-westerly wind instead of the north-easterly that was supposed to be blowing. This made the water quite choppy at the entry spot off the western point. However, there was no problem getting in. After this dive, one person left and the others stayed for the second dive. Others arrived for the second dive. For the second dive we had (as far as I can now recall) 16 divers. We geared up and then walked across the bridge to the island. The plan was to do a similar dive to the earlier one, although I had already decided that I would vary it depending on the conditions. The wind had now turned to the south-east and it was not quite as choppy as before as the island was slightly protecting our entry point (the western point). 1 - Carol Martin and Ron as buddies with John P and Gary D as buddies. Gary had a camera. A bit more about Ron and Carol. Neither had dived on the first dive. Ron is a very experienced diver, with well over 1,000 dives in all sorts of conditions. He dives to 50 metres off Sydney and has previously shown his skills when handling an out of air diver in a deep and difficult location in the tropics - as well as an overly buoyant diver on a deep wreck off Sydney. He is one of the most competent divers I have ever dived with over the past 25 years. 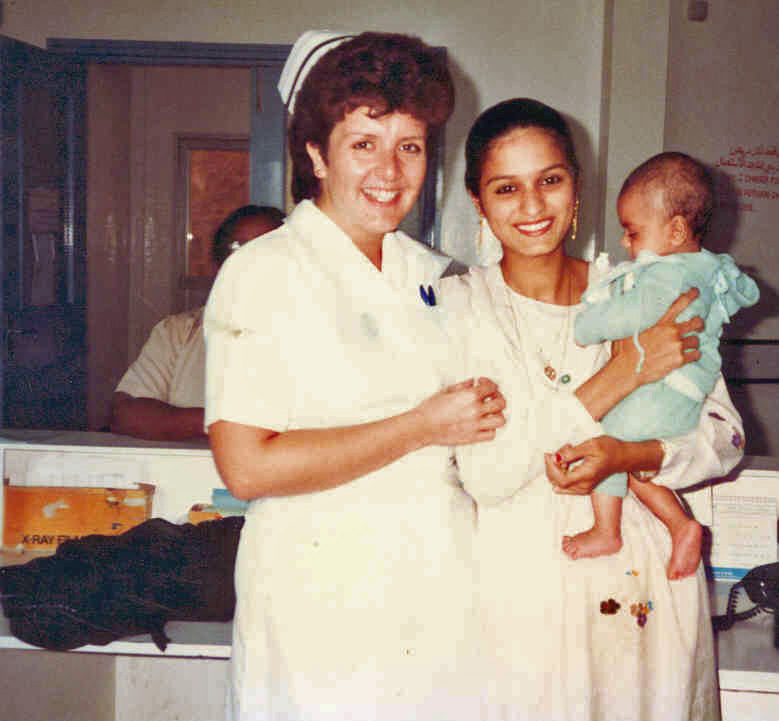 Carol Martin was born in Scotland and trained as a nurse. She travelled the world before settling in Sydney. After this, she still travelled the world. Carol had also done more than 1,000 dives, with most of these in Sydney. She also dived to 50 metres on the wrecks in Sydney and had dived locations like Papua New Guinea, Vanuatu, Red Sea and Indonesia. She had also done many trips to the Great Barrier Reef, including Osprey Reef. Again, an extremely competent diver who used very little air and who was among the best divers I have ever dived with. I have dived with Carol since 1996. In February 2010 Carol had a problem at the start of a dive at Port Stephens. While diving Halifax Point, she had breathing difficulties on the surface and soon after descending it got worse and she had to ascend. She could not breathe properly and was expelling a frothy pink sputum. She was transported by helicopter to John Hunter Hospital in Newcastle where she recovered within a few hours. Extensive tests showed no apparent reason for the problems, and it was eventually put down to the fact that she copped a mouthful of salt water as a large cruiser went past. The thought was that the water caused salt water aspiration, something I have suffered from on a much smaller scale on a trip to PNG (click here to read about that). She was given the all clear to dive again, although she was told to avoid long surface swims and to not over exert herself in cold water. Since that time, Carol had rigorously stuck to these rules and done approximately 50 dives without a problem. 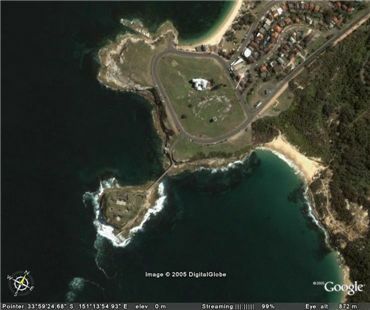 Note: click hereto see a glossary of the Bare Island dive locations referred to in this article. As mentioned above, the seas at the Western Point were calmer than on my earlier dive. 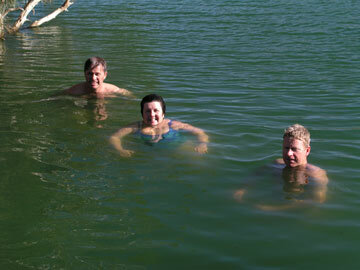 The water temperature was a minimum of 19.2°C. Ron's group descended first at 7:56 pm, probably less than a minute at the most before my group descended. They headed south-west towards the Deep Wall. My group headed west towards the Deep Wall, but closer to The Anchor. Ron arrived at the Deep Wall at about 8:00 pm. The visibility was not great, probably less than five metres. This was worse than on my first dive here which had about eight metres or more. They circled around the jumble of rocks that are located just off the wall at this location and started back to the north. They found the pygmy pipehorse that they were looking for (we had first found it a few weeks earlier). They then headed over to the wall and north past The Anchor. Meanwhile, we had dropped over the Deep Wall (here it is not so high) about five metres to the south of The Anchor. I decided not to go to the pygmy pipehorse rocks due to the poor visibility and the fact that I had some less experienced divers with me. We headed north along the northern end of the Deep Wall past The Anchor and then over to Red Indianfish Reef. This is a flat reef located to the north-west of the end of the main Deep Wall. From memory, someone found a red Indianfish here. We then headed north to the 15 Metre Reef. From here we went west to almost its end and then north again to Sea Horse Corner. This is at about 14 metres or so in depth. Instead of turning east here and following the reef back to the exit point, I decided to go over to Isolated Reef 1 as we were well ahead of schedule. Just past here I found a bright yellow Whites sea horse, the first we have seen in this area for about two or three years. From here I took the group to the northern side of Isolated Reef 1. At the very bottom I have transcribed her air consumption as recorded by the computer. The lines at the bottom of the main graph have one interesting thing. The second icon above the handwritten 40 is a set of lungs. If you look closely you will see that there are some thicker sections of this line. This indicates rapid breathing. While we were here, Ron and Carol came along the Deep Wall past The Anchor and then headed north towards the 15 Metre Reef. Between the wall and the reef is a large concrete mooring block that sits on the sand (put there by Energy Australia when installing an underseabed cable). At this spot Carol informed Ron that she was not feeling well (using the diver signal of rocking her hand side to side). Ron asked if she wanted to ascend or go straight back to the exit. Carol advised she wanted to head for the exit. I should add that at this location, you are at least 120 metres from the island and probably 200 metres from the closest reasonably easy exit spot. They had been underwater for 25 minutes and it was 8:21 pm. Around this time or just before, Ron and Carol had separated from Gary D and John P who were going a lot slower due to Gary taking photos. Ron and Carol headed over to the 15 Metre Reef and then across to Sea Horse Corner. They went by the most direct route, following the main wall. They passed Sea Horse Rock and when near the large bridge timber section near the 44 Gallon Drum, Carol advised Ron that she wanted to ascend immediately. They were almost 36 minutes into the dive and the depth was about seven or eight metres. By now, my group had returned to the main reef near Sea Horse Corner and was coming back towards the exit. We were now behind them. It took Ron and Carol about two minutes to ascend, a good safe ascent rate. Immediately they surfaced Carol vomited. It was 8:33 pm. She complained she could not breathe. Ron decided to tow Carol to the shore, probably about 100 metres away. Along the way, Carol continued to complain she could not breathe. Ron at one stage asked her to kick if she could to assist them. She said she was. We have calculated that it would take at least 7 to 10 minutes to tow a person this distance and maybe longer. Ron aimed for the bit of island to the east of The Pool. This is the first easily accessible exit spot when coming from the western side of the island. As he approached the shore, some fishers shouted out to him to look out for their lines. He advised them he had a diver with problems and they helped him get her up onto the rocks. I assume this took a minute or two. By now, my guess is that my group was approaching the location where Ron and Carol ascended. Of course, we had no idea what was going on above us. When we got closer to the exit, I actually swore (underwater) at the fishers for not pulling in their two fishing lines that we had to avoid as we passed by. Once the fishers and Ron had Carol up on the rock platform, Ron took off his fins (he may have done this before) and then he took off his gear and put it away from Carol. He returned to Carol to see that she was now not breathing. He loosened her BCD and commenced CPR. He asked the fishers to ring for help. They used a mobile phone and rang 000 and arranged for Police and ambulance to attend. It was now, by my figuring, about 8:41 pm. Ron asked the fishers if they knew CPR but they did not, so he worked by himself. I was first out of the water. As normal, I exited onto the Boat Ramp near the bridge. I got to my feet, sat down on the side of the ramp and removed my fins. I had been under for 51 minutes and exited the water at 8:47 pm. I heard someone on the bridge shouting out something but I could not hear what they were saying. I took off my fins and within a few seconds, a fisher came running to me and said something like, "Your friend is in trouble. She is not breathing". I looked towards the west and saw someone kneeling over a person. I jumped up and ran as fast as I could (remember I still had all my dive gear on) towards the figures. As I got closer, my torch highlighted the scene and I could tell that it was Ron working on Carol. I can tell you I swore a lot while I was doing this. I went back a bit towards the higher sections of the rock platform and dropped all my gear here (I later remembered I left my fins behind). I ran to Ron and he asked me to take over the compressions. As soon as I got close I knew it was not good. Carol was already very pale and not responding. I started doing the compressions. Luckily Ron must undergo CPR training every year due to his work, so he was familiar with what to do. It was at least four years since I had done the course. From here on is a bit of a blur, the time compressing what may have been minutes into seconds or even expanding seconds into minutes. I really am not sure how long I did CPR, but probably only two minutes. Then, Simon (who was in my group) arrived on the scene and he relieved me. Ron continued doing the breaths. I think at this stage I got some of the others who had now exited the water to gather Carol's BCD and tank and move it and then remove her fins which were still on her. I know that we discussed cutting off her wetsuit to assist but we agreed that it would probably be too hard to do with a dive knife and would also mean we would have to stop CPR for a while. I also asked some of the other divers to go up to the main road to direct the Police to where we were as I did not know how accurate the location was that had been given by the fishers. I think that after a couple of minutes I relieved Simon doing the compressions. Within a minute or so of me restarting CPR, I saw the Police pull up and then run across the bridge. When they arrived, they offered to take over the CPR. I think it was Senior Constable Dean Lennox who took over the compressions and a female constable took over the breathing. At least two other constables arrived at the same time. It was now probably about 8:53 pm. The past six minutes seemed to me at the time to have been like an hour, but looking back it seems like only a few seconds. Up at the road, a Police officer somehow opened the gate which leads to the bridge. He may have been the Sergeant who had a copy of the key. 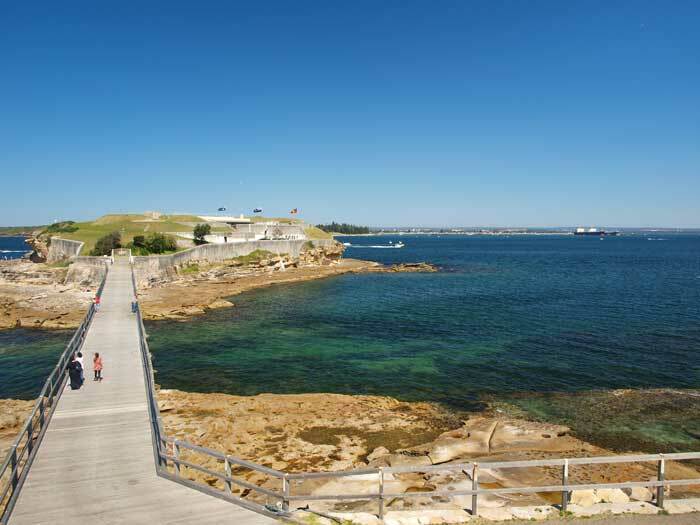 One of our members had attempted to phone the NPWS Ranger who lives on Bare Island to get him to come across and open the gate but his phone was off. The ambulance arrived about four minutes later I think, having driven across the bridge. The ambulance officers came down onto the rock platform with their equipment. The Police officers continued doing CPR, although I think that the other officers might have replaced the first ones. At first they worked on Carol on the edge of the water but after about five minutes, it was decided to transfer her to the higher rock platform. There were now more Police on site and another more senior ambulance officer arrived. The Police Rescue Squad arrived and they would be needed to assist to Carol up to the bridge. Around this time we noticed the lights from the third group of divers approaching the rock platform. I went over to wait for them and told them what happened. We had to almost carry one of the female divers out of the water she was so distressed. By now it was very apparent that Carol was not going to be revived. Despite numerous drug injections, oxygen and continued CPR she did not improve. We were asked to move away about this time and I gathered my dive gear and climbed the stairs to the bridge. At the top an officer took our details. I slowly walked back to my car, shocked at what had happened. At my car I took off my gear. Carol was parked behind me. I changed out of my wetsuit and shortly Ron came up and advised that the ambulance officers had stopped working on Carol and declared her dead. It was about 9:40 pm from memory. It was all so surreal. I started thinking of what needed to be done. I needed to get home to tell Kelly, my wife, of the death of her best friend. I did not want to phone her with this news as she was already in a fragile way as just before we started the dive, she had called me about our dog who had almost died earlier that evening from strangling when her name tag got caught in a drain at home. I also wanted to get to her before the news got around and to phone Carol's ex-husband, Robbie, before he heard about what had happened (he had dived with me on the first dive but had then left). I advised the others I was leaving and why and headed off. It was a long trip home. Telling Kelly what happened was the hardest thing I have ever had to do in my life. It was even harder than telling my brothers and sisters that my Dad had died, as his death was not totally unexpected. Kelly would not believe me when I told her. She was in denial. I phoned Robbie but he had already heard about it from another member who had been called by one of the other divers. I had meant to tell them all not to ring anyone for at least an hour to give me time. What happened? My immediate thought was that it was the same thing as a year ago, as the symptoms were the same - including shortage of breath. Later that night (well very early the next morning), Ron dropped by our place after giving his police statement. I read his copy and it was clear that nothing had gone wrong with the dive. It must have been be some underlying illness or event that caused it. On Monday 7 February 2011 Kelly and I took Carol's sister June and her husband Bill (they had arrived from Scotland the day before) to the NSW Department of Forensic Medicine morgue at Glebe to view Carol. When we were there, we had the opportunity to read the preliminary post mortem report as well as speak to the pathologist who conducted the autopsy. The doctor who did the autopsy agreed that the blood in the pericardium and left ventricle probably occurred as a result of the CPR. Soon after this, my feeling from speaking to doctors and dive medicine experts, including Dr Carl Edmonds, was that Carol suffered from Immersion Pulmonary Edema (also called Immersion Pulmonary Oedema) or IPE. This is where a person who is in water (salt or fresh) that is (generally) less than 20°C suffers breathing difficulties. It can hit fully fit athletes as well as less fit people. All the available literature on the internet shows that there is no known reason for it to affect some people at some times. What is believed to happen is that when the body is submerged, some of the blood that is normally in the extremities (arms and legs) gets redistributed to the heart, lungs and brain. This appears to be somehow due to the water pressure (even just floating in water produces enough pressure for this to happen) tricking the body into sending fluid contained in the blood back to the vital organs. Then, for some unknown reason, the body decides to let this fluid to be released into the lungs. Instead of being processed by the kidneys and turned into urine and/or breathed out as water vapour, excess fluid is concentrated in the lungs, making it hard to breathe as the water blocks the uptake of oxygen. One theory is that being over hydrated may cause or increase the problem. Thus, the person finds it hard to breathe. Upon surfacing, vomiting or coughing up of pink, frothy sputum occurs. Generally, the condition is not fatal and the application of oxygen restores normal breathing. It appears that the number of cases of IPE is increasing, but it is not known why. The internet has a lot of information about IPE, do a search on Immersion Pulmonary Edema. An interesting link you will find is a study done on fit 18 year old Israeli Navy recruits doing surface swims. The number that suffered IPE over the study years is considerably high. In January 2012 we were given a copy of the Autopsy Report. This confirms what I have written above (which was written in February 2011). The finding of the Pathologist, Dr Stephen M Wills, was that Carol died from Immersion/Scuba Divers' Pulmonary Oedema (Edema). As a result of some questions by the Police (see next section), it was mentioned by a couple of the divers (Ron and Simon I think) that Carol only had about 70 bar of air left at the end of the dive. In fact, she had 57 bar left from a 210 bar tank (it was a 9.0 litre tank). I know this as on 17 October 2012 I was permitted by the police to download her computer to my laptop. As she was the most frugal user of air I have ever dived with, this is something that has confused me. I would have expected her to have at least 130 bar left. This means she used a huge amount of air. The dive profile and air consumption is shown in a graph above. This provided a lot of answers but has also created many question for me. See below in air consumption. As mentioned, the only person interviewed at length was Ron, although Gary, John and I were asked to provide a statement by email to Constable Dean Lennox, the officer investigating. We did this, but to date none of us were contacted again for any clarification. A question was also asked: had we turned off Carol's tank once she was out of the water? One of us did. Constable Lennox ran Ron's statement past two Police officers who were experienced divers (one an ex-Police diver and the other an instructor who I believe I know) and had Ron clarify one or two things. Ron had provided a full and complete statement that fully captured all the relevant information. I assume that Carol's dive gear was fully tested as I understand it was passed onto the Police diving section. I do not think the equipment had any influence at all on what happened (I now have all the gear, including regualtors and they work perfectly). An inquest into Carol's death was held on 5 December 2012. Kelly and I attended. At the inquest, it was found that IPE was the cause. A recommendation was made by the Coroner that more study needs to be done into IPE and that scuba divers need to be made aware of it. However, no more light was shed on what might ahve caused this to happen (apart from perhaps that her previous incidence made her more suscepible to another episode). As mentioned earlier, I downloaded Carol's dive computer and looked at the last dive. I also downloaded her previous dives. Unfortunately, the dive where she previously had an episode of IPE had been deleted due to over-writing (new dives replacing the oldest dives). it would have been interesting to see that dive as well. I have repeated the printout of the dive below. I will discuss it in detail below the diagram. 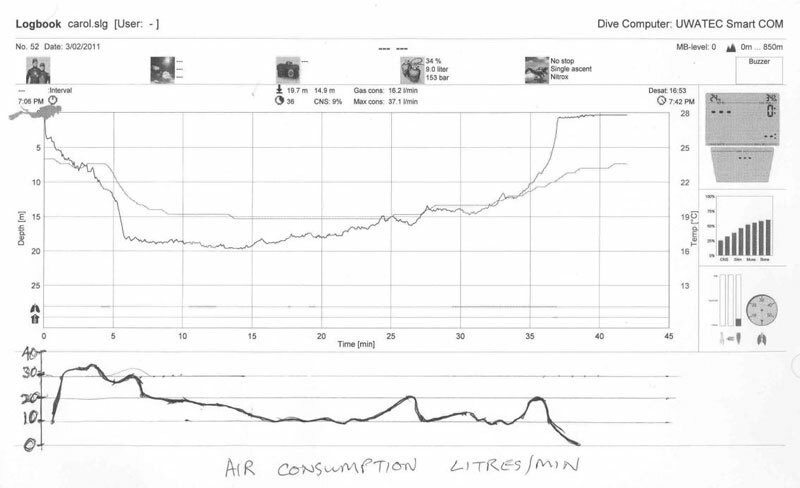 Note that Carol's normal air consumption on her previous dives averaged about 10 to 11 litres per minute. As you can seen from the above graph, Carol's air consumption was very high as soon as she entered the water. This swim out normally takes me about 4.5 minutes, so you can see that Ron and Carol did it even slower than we normally do, taking about six minutes. Her air consumption for this part of the dive was at least 30 litres per minute for most of the first five minutes of the dive, reaching about 34 litres per minute. Once she dropped over to the sand at 18 metres, her consumption dropped to about 20 litres and then over the next 10 minutes it reduced very evenly back to 10 litres per minute. This section of the dive should have had a current (if any existed) behind them so there should have been no impact. Ron did not report any adverse current. From about the 16 minute mark till 23 minutes her consumption was normal. After her, the consumption started to increase in a very even manner. It peaked at 20 litres per minute at the 22 minute mark. This happens to coincide with just after Carol told Ron she was not happy. Note that small dip and rise and dip before this gradual rise (in air consumption) is where I think she first told Ron she was not feeling well. You will notice that Carol's consumption then dropsed very rapidly back to 10 litres per minute at 22.5 minuites and then rises a little to about 13 litres before again dropping and then going on a roller-coaster between 11 and 9.5 litres. It really should have been constant. At this point is where Carol informed Ron that she wanted to surface. You will see that her consumption rapidly increases again to about 20 litres per minute as they start to surface but then starts to drop dramatically to a point where she is again breathing 10 litres per minute at five metres. It continues to drop and when she surfaces the consumption drops below a level that is life sustaining. You can see that they are on the surface for about about five minutes before the computer stops recording. Well befor this happens, Carol's air consumption has gone to zero. It seems to me that she had stopped breathing before she was removed from the water. If she had stopped using her regualtor when she surface, the air consumption would have ceased immediately. What Does All This Tell Us and What Happened? The air consumption is very interesting in that it tells us all was not right from the start. Carol's consumption should have been a very level 10 or so litres per minute, with perhaps a small increase here and there if she had worked hard for a few seconds. Something obviously set off her breathing right at the start, and while she was able to get it under control, she was not in control. I do not think we will ever really know what caused this to happen to Carol. As far as I can see, nothing untoward happened before or during the dive (like Carol breathing in saltwater). The only thing that I am not sure of was her wetsuit too tight? This has been suggested as a contributing factor, but as the wetsuit was cut off by the ambulance officers, we will never know. While it is certain that Carol died from one of the increasingly less rare cases of Immersion Pulmonary Edema, why it happened we will also never know. Dr Carl Edmonds, who co-wrote the bible for dive medicine, Diving and Sub-aquatic Medicine, is looking into IPE and especially Carol's case. He is convinced that this is what caused Carol to die. The one thing is that it has so far been impossible to find a trigger that causes a person to suffer from IPE. As mentioned, some have suggested triggers could be drinking too much water before a dive, tight wetsuit/BCD. 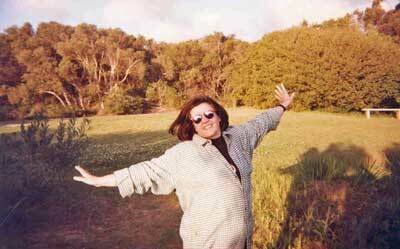 The following links to a paper on IPE which specifically mentions Carol's death. It is entitled Scuba divers' pulmonary oedema: recurrences and fatalities by Dr Carl Edmonds, John Lippmann, Dr Sarah Lockley and Dr Darren Wolfers in Diving and Hyperbaric Medicine Volume 42 No 1 March 2012. Tjhis is another Scuba divers' pulmonary oedema. A review by Dr Carl Edmonds from Diving and Hyperbaric Medicine Volume 39 No 4 December 2009. 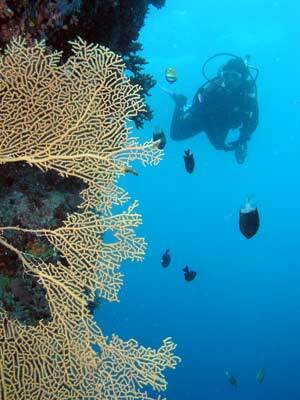 I think the only thing we as divers can do is to take immediate action if you ever have problems breathing. If you are on the surface before descending, abort the dive and return to the shore or boat and breathe oxygen if possible. If underwater, you should consider ascending immediately, especially if near your boat or the shore. If a long way from the shore, it may be better to stay underwater for as long as possible, but I am not sure about this. In either case, I would not do a safety stop (as presumably you will not have been down long enough to get near the no-deco limit). If you are in decompression, consider minimising it to do only what is required by US Navy tables. If a buddy indicates that they have problems breathing, again, consider ascending immediately as above, even if your buddy does not want to. If the person gets worse, consider using there regulator to force air into their lungs. This article has been written with the approval of Carol's family as well as the main people who were involved in the incident. It is written to draw the attention of divers to the sort of things that can go wrong on a dive, even if nothing has been done wrong.